Colorful new world. 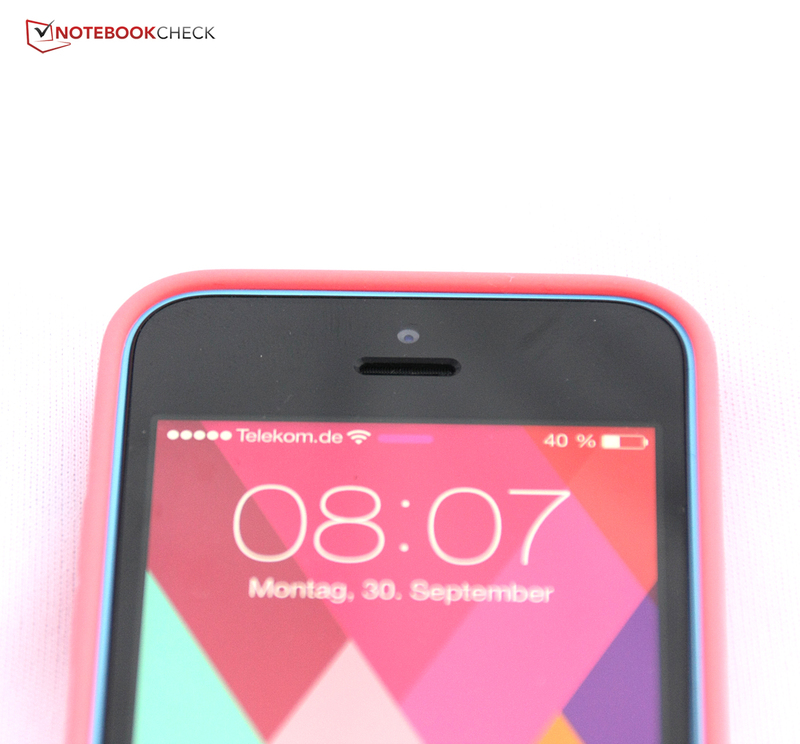 The iPhone 5c has arrived - it is 100 Euros (~$135) cheaper than the new iPhone 5s, comes with a plastic case and is available in a variety of different colors. The innards are basically those of an iPhone 5. So it's neither a true bargain, nor a truly innovative device - but can Apple's new "inexpensive" smartphone still make a compelling case for itself? And what about the new operating system, iOS 7? Somehow, most investors had expected a bit more on September 10, 2013. Or a little less, as they had hoped that Apple would finally release a truly affordable iPhone within range for the masses in developing markets such as China and India. Well, so much about that - the iPhone 5c costs at least 599 Euros (~$813), making it too pricy even for most middle-class citizens in these countries. But what about Apple's fans in Europe and the US - may they rejoice? 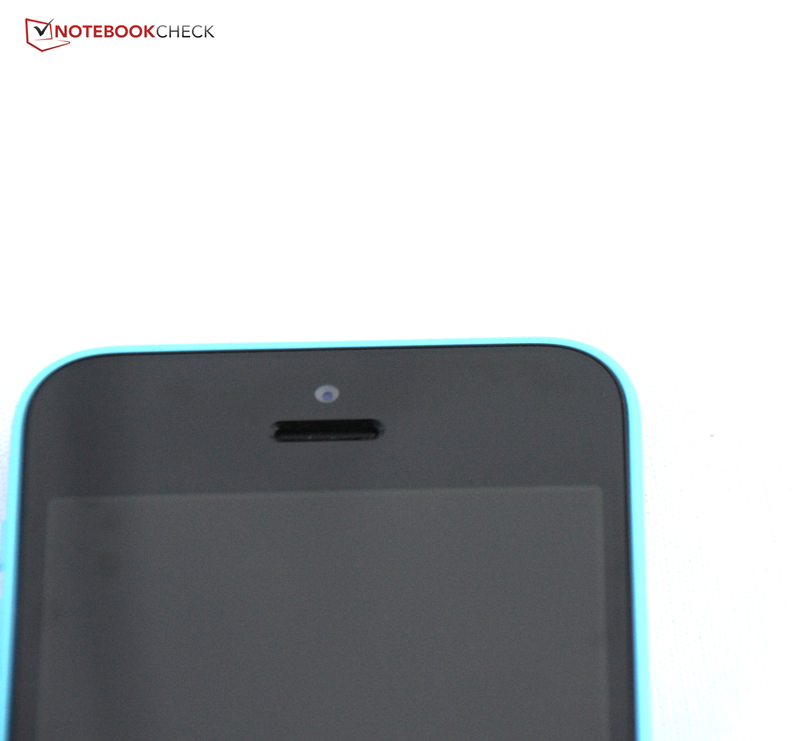 The iPhone 5c closely resembles the iPhone 5 in terms of its innards, with the only exceptions being support for more LTE bands, a slightly larger battery and a somewhat revamped Facetime camera - no true innovations here. 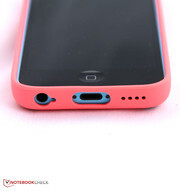 On the outside, however, a colorful plastic case has replaced the aluminum one used for the iPhone 5. The price? 100 Euros (~$135) less than what one has to pay for the high-end iPhone 5s model (which will arrive in our labs shortly). We will compare the iPhone 5c to its closest sibling, the iPhone 5, but also to a selection of current high-end and mid-range smartphones. 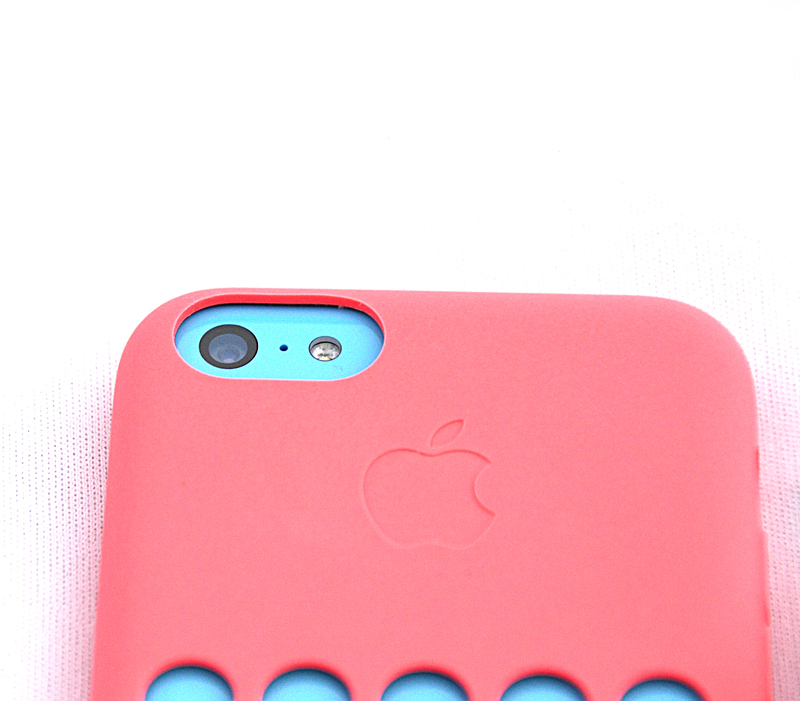 Now available with a colorful plastic case: One of Apple's two new iPhone variants, the iPhone 5c. 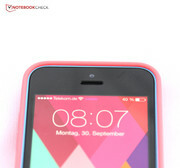 Green, blue, yellow, pink and white - the five colors which Apple offers with its iPhone 5c all refer to its rear shell made from glossy plastic instead of aluminum. 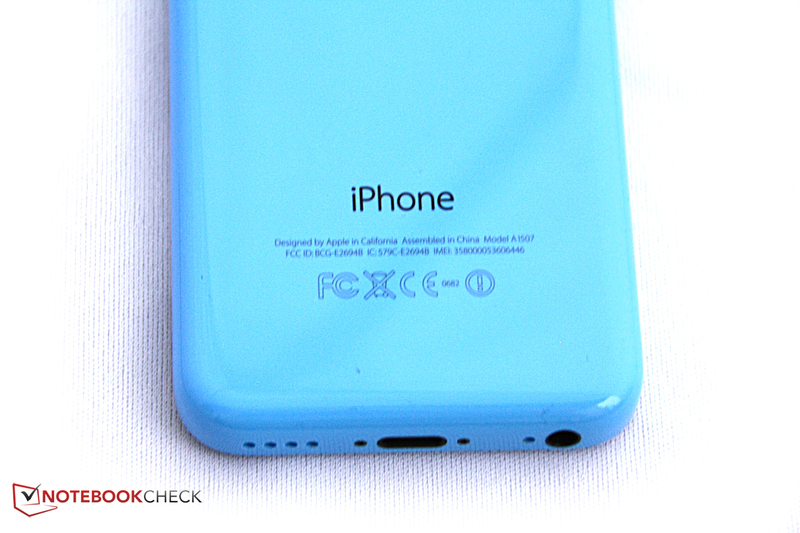 This renders the back of the iPhone 5c rather prone to fingerprints while a special coating is supposed to prevent them from sticking to the front (which doesn't seem to work too well, though). 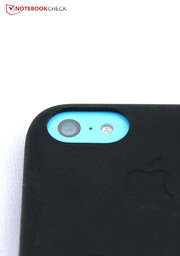 Apple offers matching silicone cases which are available in all these five colors plus black. 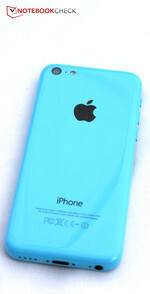 The resulting two-shell look reminds us of the Nokia Lumia 620. Generally, Apple seems to be fond of Nokia's colorful product strategy which the Finnish company has employed with its entire Lumia line. However, colorful iPods have been around for a long time. So what about the iPhone 5c's stability? 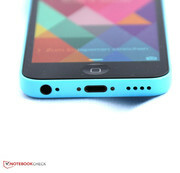 Apple doesn't rely on the plastic case alone, integrating an internal metal frame into the body. The resulting smartphone not only feels very sturdy, but also sports some first-class build quality: No irregular clearances, no creaking. Unfortunately, applying a medium amount of pressure to the screen is enough to result in display errors emanating from the sides. 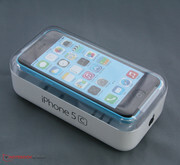 The iPhone 5c is a bit larger than the iPhone 5 in all dimensions: It is thicker by more than 1 millimeter (now 8.97 millimeters) as well as slightly wider and longer. 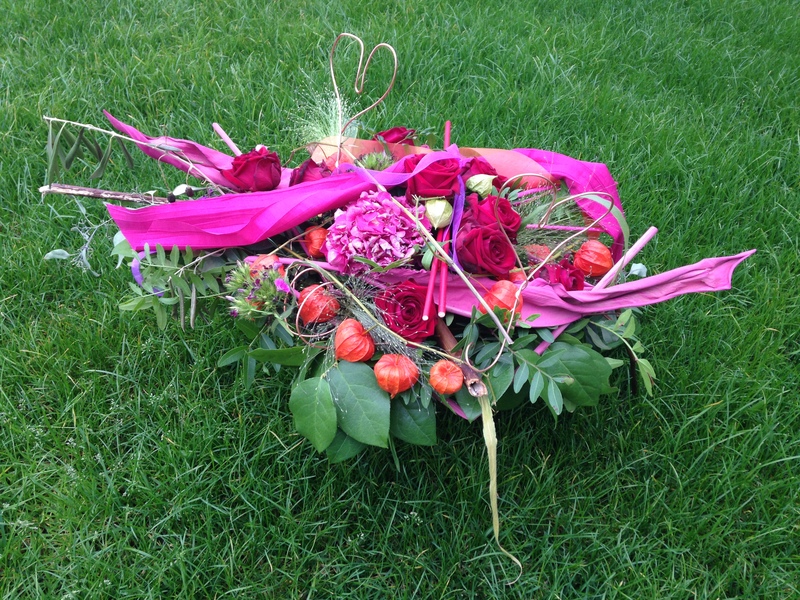 In addition, it is noticeably heavier by around 20 grams. 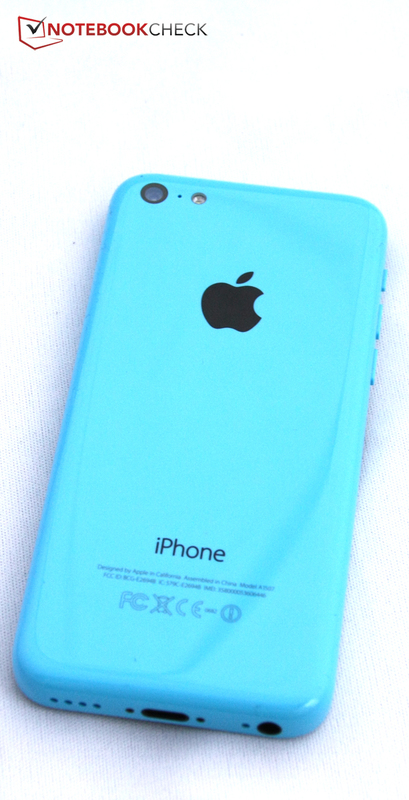 Still, the iPhone 5c with its premium build and haptics feels great to hold. 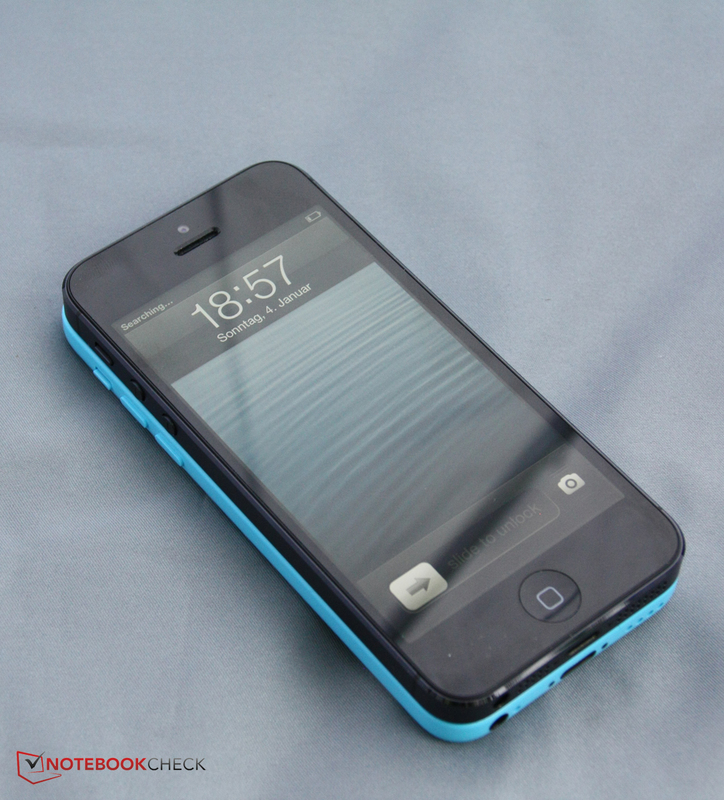 Not much has changed in regard to the connectivity options: As with the iPhone 5, the power button can be found on top, the volume rocker is on the left, with the mute toggle located right above it. 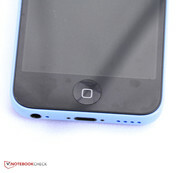 No SD or micro SD cards can be inserted into the device, with only a Nano SIM slot being available (on the right hand side). 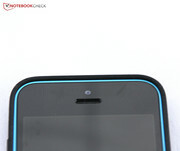 Below, the Line In/Out port and the smaller Lightning port (introduced with the iPhone 5) can be found. Since Apple has released iOS 7 together with its two new iPhones, Apple users are debating fiercely whether the complete redesign has long been overdue or whether it has to be seen as a step backwards. After all, much has changed, especially in terms of its look and feel, with a number of modifications. So far, all of Apple's mobile operating systems have tried to recreate real-life objects or surroundings with their app symbols, textures and backgrounds - like the wooden bookshelf for e-books and digital magazines or the paper-like notepad. 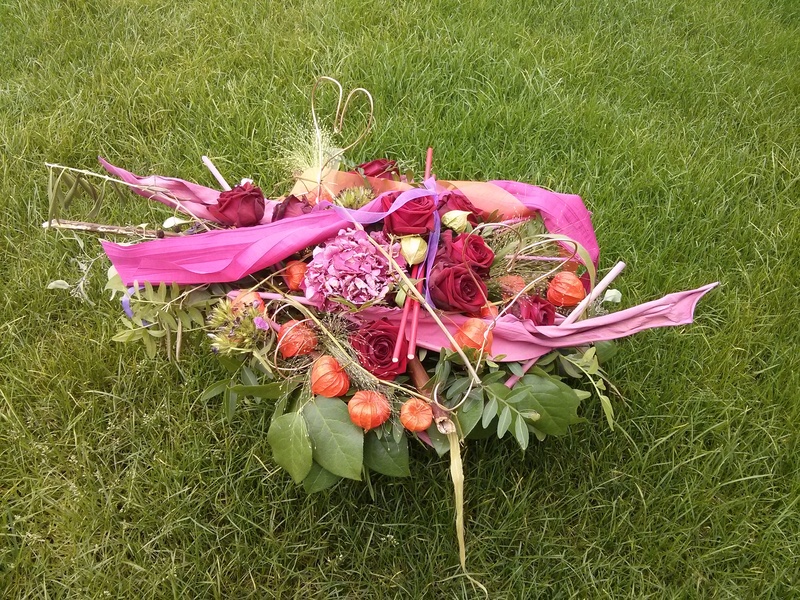 Imitating reality in such a fashion is called a skeuomorphism. But these are now a thing of the past. Everything has become simpler, flatter and more straightforward in iOS' new design language - while a number of new transition effects have been introduced (even leading to some users being afraid of "motion sickness"). Our two cents: A redesign has indeed become necessary. The new iOS 7 looks a lot sleeker and more modern than the (by now stale) style of 2007 in all iterations of the operating system before it. We think that the removal of cast shadows and 3D effects has helped in making iOS 7 feel fresher. While Android is (or at least was) better known for its practical, customizable UI than for its inherent beauty, Windows Phone with its Modern UI has turned into a formidable competitor in terms of its design language, forcing Apple's hand. We are quite happy about the result - and we are sure that most users will quickly feel at home in these new surroundings. Apple has taken care to introduce only a few slight tweaks to the actual user experience: Unlocking the phone works as it always did (by swiping to the right), holding the home button activates Siri (the voice control system) and holding an app icon allows the user to delete or rearrange apps. But while a double tap on the home button still opens the list of apps running in the background, the whole experience has been made more user-friendly and clearer, with large preview windows and a simple swipe upwards being enough to easily close an app. From the lower edge of the screen, a quick access menu can be pulled up which allows the user to quickly toggle Wi-Fi, airplane mode, "do not disturb" mode, Bluetooth, screen orientation, screen brightness and media player settings. In addition, some often-used apps (calculator, timer) can be accessed here. The notification center (which can still be pulled down from the upper edge of the screen) contains all current notifications and calendar entries for the day. The Spotlight search feature can now be accessed by swiping down anywhere away from the upper edge of the screen. Also known from Android: The "car mode" which allows for many functions to be controlled via Siri for distraction-free driving - no hands or eyes required. Still, while iOS 7 feels like a revolution in terms of its design, handling feels pretty much the same as it did in iOS 6, with some nice tweaks here and there. But this doesn't have to be a disadvantage - after all, iOS 6 felt very intuitive to begin with. Apple's own apps have been tweaked in terms of design and functionality as well. The photos app, for example, now sorts the pictures in it by date and not by album. The calendar app has changed the most: In the top row, the next (and last) few days can quickly be accessed, it takes just one tap to reach the view by months, the search function is directly visible and it has become far easier to scroll through different days and weeks. 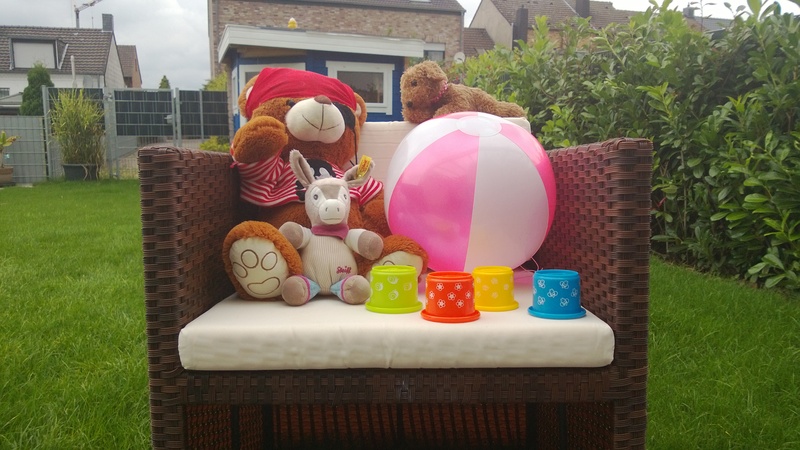 The camera app has seen its fair share of changes too: It is now easier than ever to choose a certain format (video, photo, square, panorama) or select one of a number of popular filters with just a few taps. 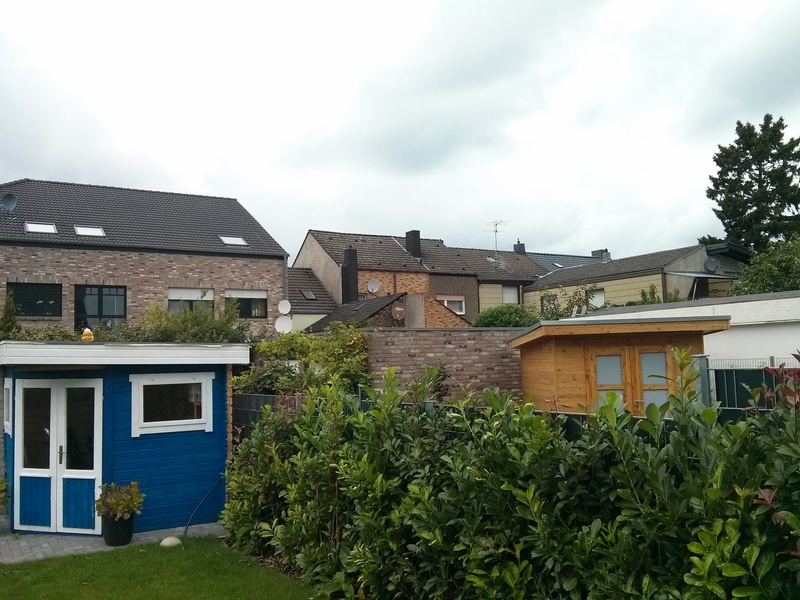 Even the HDR mode has become easier to access. Not much has changed for the messages app and the App Store app - except for the new look, of course. The new iPhones ship with support for more LTE bands than ever, becoming compatible with most providers worldwide. In addition, four GSM bands and five UMTS bands are supported making it hard to find a spot where the iPhone 5c cannot connect to a network. Thus, browsing the web with LTE speeds of up to 100 Mbit/s (downstream) and 50 Mbit/s (upstream) is possible in more networks than ever (including O2 and Vodafone in Germany). In our real-life tests, "only" up to 70 Mbit/s is reached, but this is most likely due to the carrier and not because of the iPhone 5c. However, LTE Plus with speeds of up to 150 Mbit/s is reserved for the iPhone 5s. The Wi-Fi module does not yet support the new 802.11ac standard, but at least all previous ones. Still, signal strength during our test at home was merely mediocre. With 10 meters (and two walls) between the iPhone 5c and the Wi-Fi router, just one third of the original signal strength remains, leading to an extremely slow browsing experience. 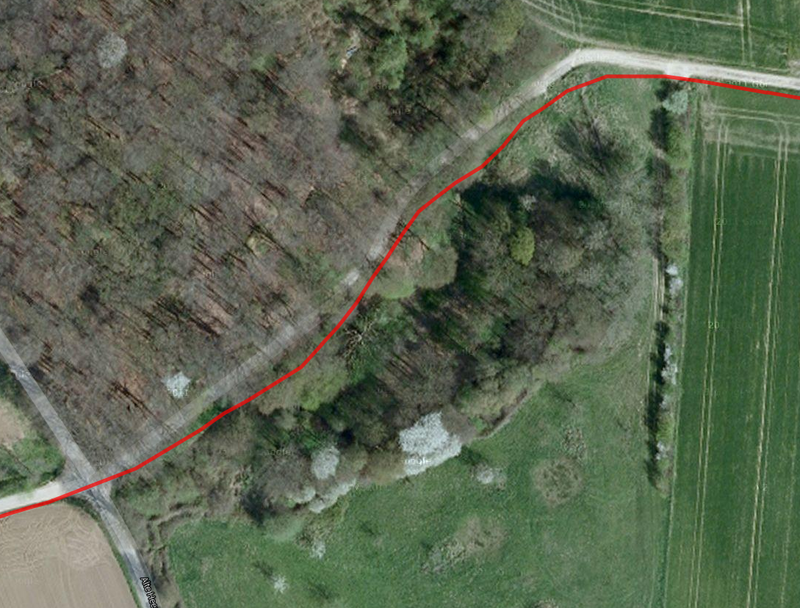 After we traced back our steps (by 1 to 2 meters), reception quality improved quickly. 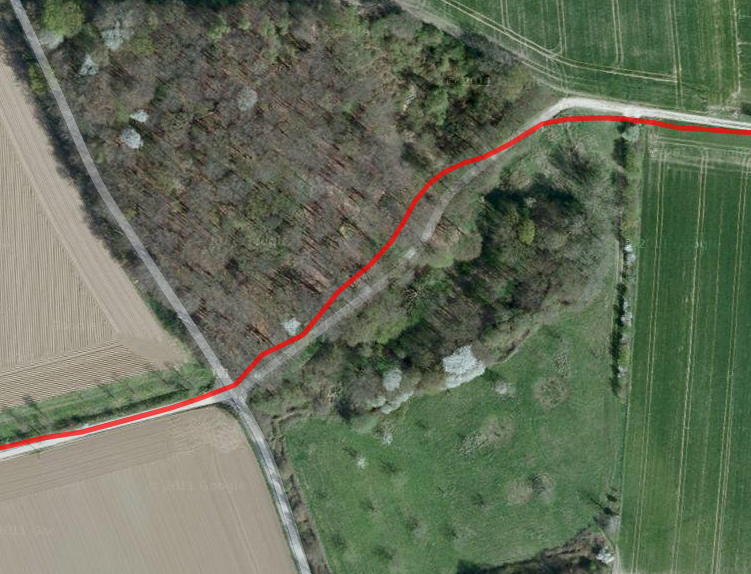 This time around, our GPS test is a bit more time-consuming: We took a bike through some fields, including some patches with a large number of trees. 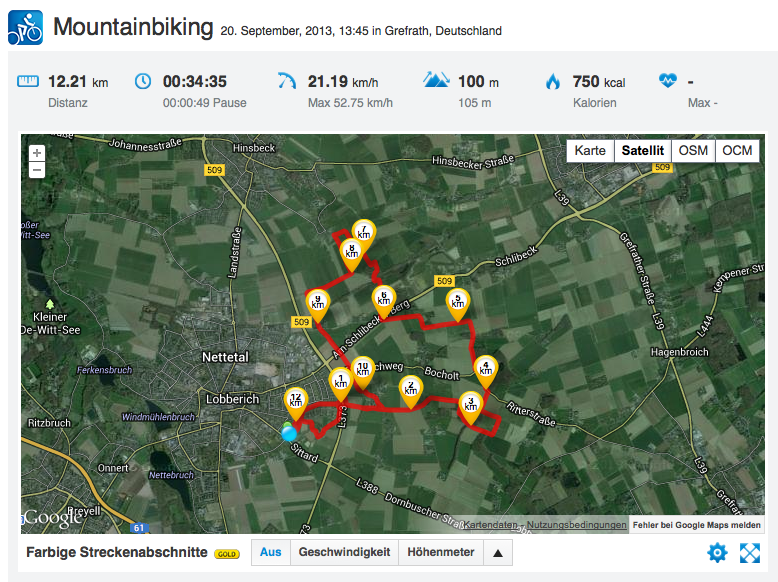 A specialized navigation system made by Garmin accompanied us as well. The surprise, after we analyze the data with Runtastic: The iPhone 5c is actually noticeably more precise than Garmin's navigation system. 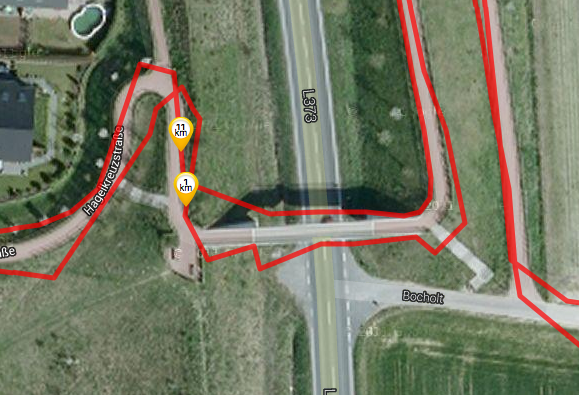 Taking a closer look at the bridge crossing, it becomes evident that the iPhone 5c follows our path very well while the Garmin device seems to locate us a few meters to the side, zigzagging through fields and streets alike. 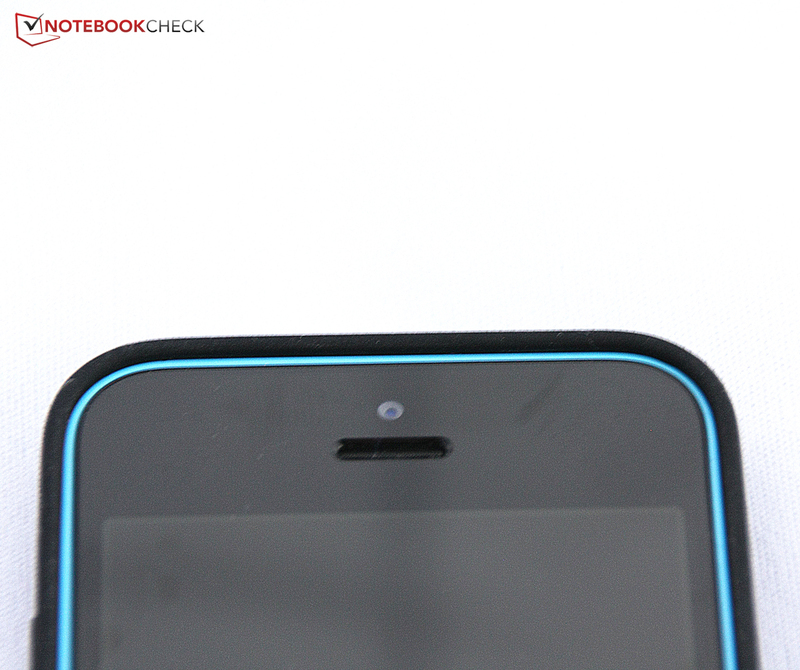 Both devices do have trouble locating us in the forest, but even here, the iPhone 5c takes the lead. Thus, the GPS module of the iPhone 5c can only be called excellent. Even indoors, our location is determined quickly and precisely. The telephone app has seen a redesign as well, but the handling hasn't changed. It remains easy and comfortable to accept or decline calls, to reply with (pre-defined) messages and so on. 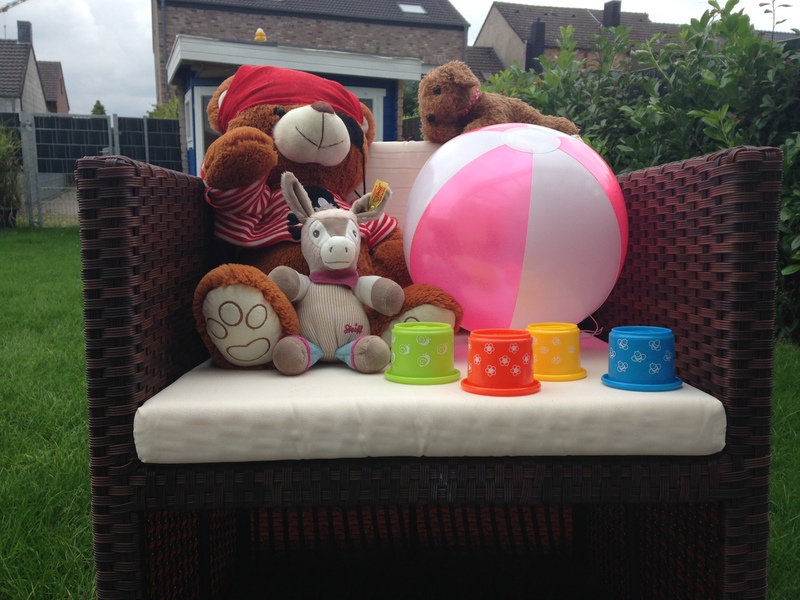 Voice quality was very good, in both directions, with clear speech recordings reaching both participants. The same holds true for the speaker phone. 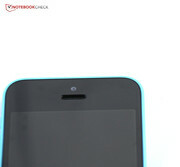 The cameras of the iPhone 5c are the same as those in the iPhone 5, with a rear camera with 8 megapixels (3264x2448 pixels), LED flash and auto focus. The sensor still captures a fair amount of detail even under low-light conditions, resulting in decent pictures. 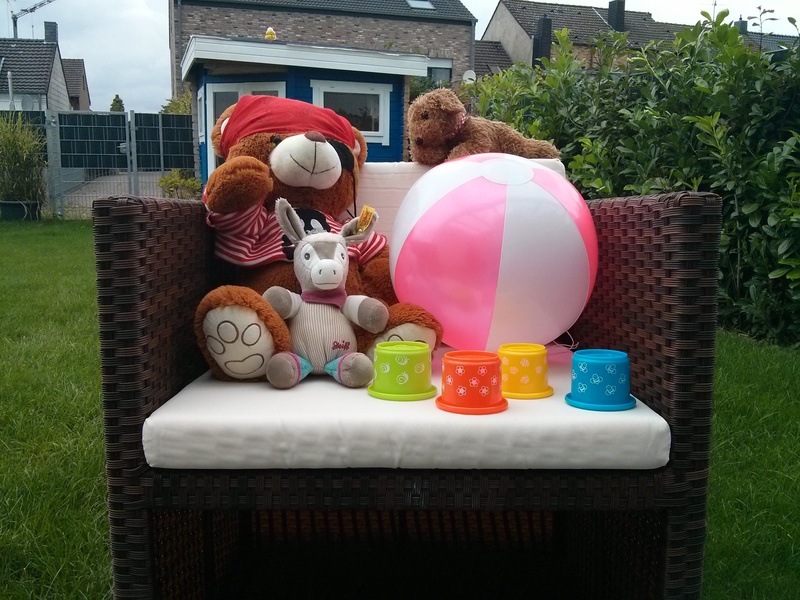 Unfortunately, the pictures taken with the iPhone 5c tend to come with a slight bluish tint. Sharpness is not as good as with the Sony A57, but it is definitely on par or better than most other smartphone cameras. Indeed, the picture quality appears to be identical to that of the iPhone 5. The front camera (1.2 megapixels, resolution of 1280x720) is only supposed to be used for self-portraits or Apple's video call app Facetime. Talking about video: The image stabilization still works very well, leading to sharp and vivid Full HD videos. Again, nothing has changed when compared to the iPhone 5. The same holds true when one wants to watch movies with the popular .mkv format: No native support exists, making it necessary to download third-party apps instead. 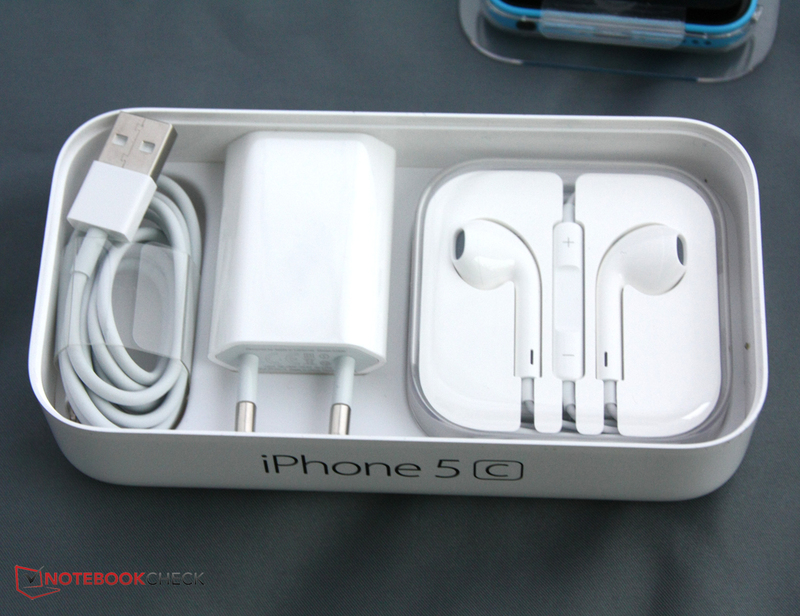 Next to Apple's improved headphones (the EarPods which have been included since the iPhone 5 was released), the stylish box in which the iPhone 5c ships also contains a charger with a USB-to-Lightning cable. 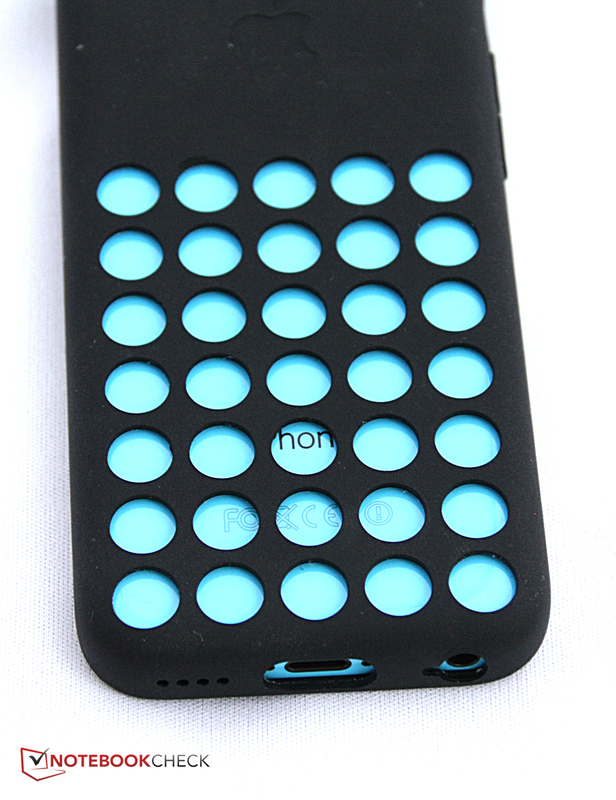 As mentioned previously, the optional silicone cases come in six colors. They can be bought for 29 Euros (~$39) each. The iPhone 5c dock costs 29 Euros (~$39) as well, while a range of adapters and cables can be purchased for 19 to 49 Euros (~$25 to ~$66). Apple offers one year of warranty (and, in the EU, the obligatory 24 months after the purchase date). An AppleCare+ Protection Plan for a total of two years of warranty (and two years of phone support) costs an additional 99 Euros (~$134), but it does include unintentional damages caused by the user themselves. In this case, another 69 Euros (~$93) is due for every repair. iOS 6: Capital letters, even when typing in lower case. iOS 7: Not much has changed in terms of functionality. Basically, the capacitive touchscreen of the iPhone 5c is just as good as that of the iPhone 5. 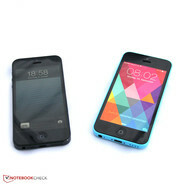 It is fun to smoothly glide across the glass surface, precisely reaching the target spot. 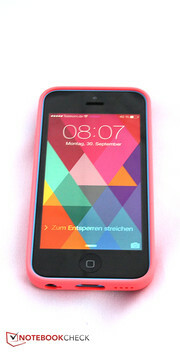 The iPhone 5c is multitouch-capable, but most of these gestures involve only two fingers (such as zooming in or out on websites or in the photos app). iOS 7 is the perfect companion for touch input. All new functions, like swiping upwards at the lower edge of the screen to open the quick access menu or swiping down to open Spotlight, work quickly and reliably. We hardly ever had to repeat a command. Not much has changed here when compared to iOS 6: The keys sport the same size and the same arrangement. They do feel a little small by now, especially since most other flagship devices ship with far larger screens than the iPhone, reaching up to twice the screen real estate. Confusing for users of Android or Windows Phone: Letters are always depicted as upper-case, no matter whether one is actually typing capital letters or not. Apart from this minor inconvenience, text input works just as quickly, reliably and intuitively as on all previous iPhones: After a certain settling-in period (as is the case for all devices), most users will be able to type well with the iPhone 5c's virtual keyboard. As mentioned above, the 4-inch display with its aspect ratio of 16:9 feels almost a bit tiny when compared to other high-end smartphones (or, even worse, phablets). The same holds true for the non-HD display resolution of 1136x640 pixels. Still, the Retina display offers vivid colors, fantastic screen brightness and - like most panels Apple uses - great color space rendition. Talking about brightness: Apple has actually managed to best the average brightness of the iPhone 5 by 50 cd/m², reaching a peak value of 572 cd/m² - making it almost twice as bright as the display of the Google Nexus 4. 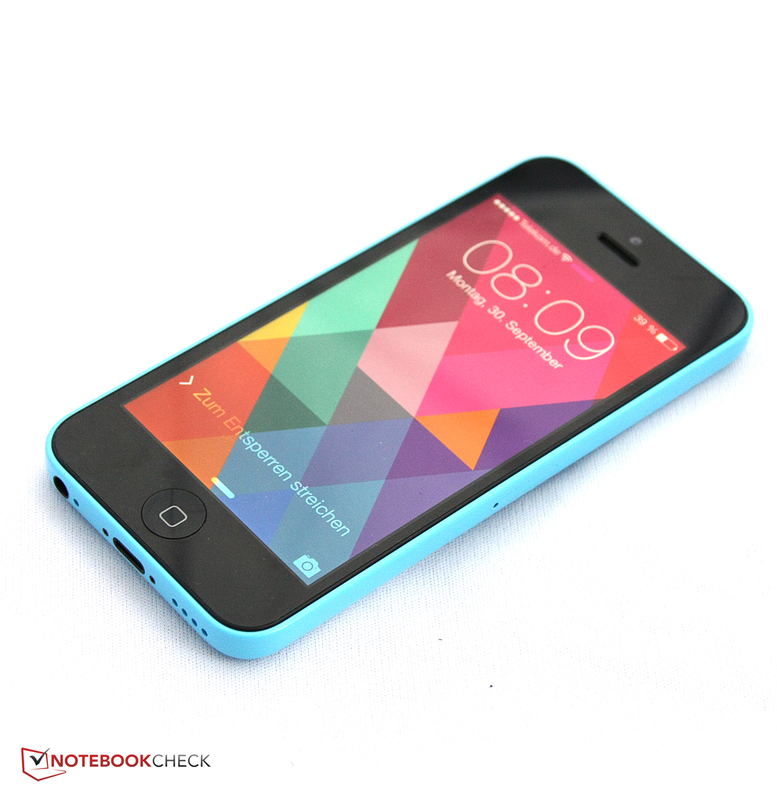 Subjectively speaking, the Retina display used in the iPhone 5c remains one of the best in its class, with vivid colors and bright whites. 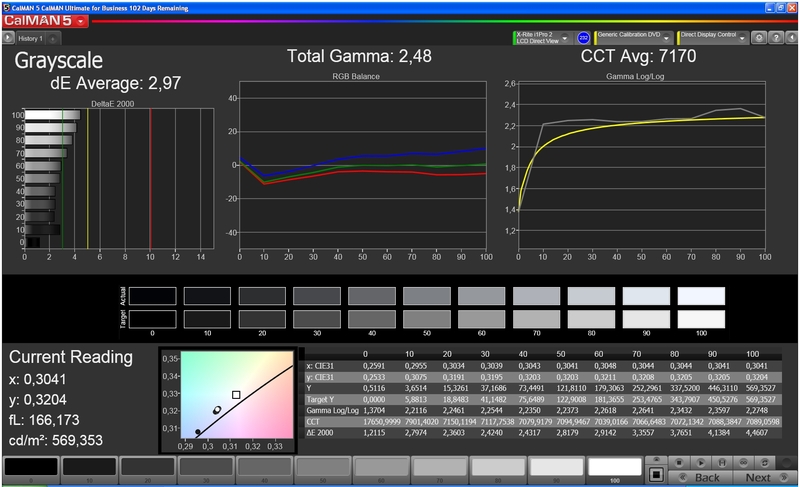 Surprisingly, the measured black levels of 0.66 cd/m² were among the highest of all test devices, leading to a below-average contrast ratio. When compared to AMOLED displays such as that of the Samsung ATIV S or the Galaxy and Note series, the blacks on the iPhone do appear more grayish and pack less punch than those of its competitors. The iPhone 5c does fare a lot better in our colorimeter tests where we used CalMAN software. 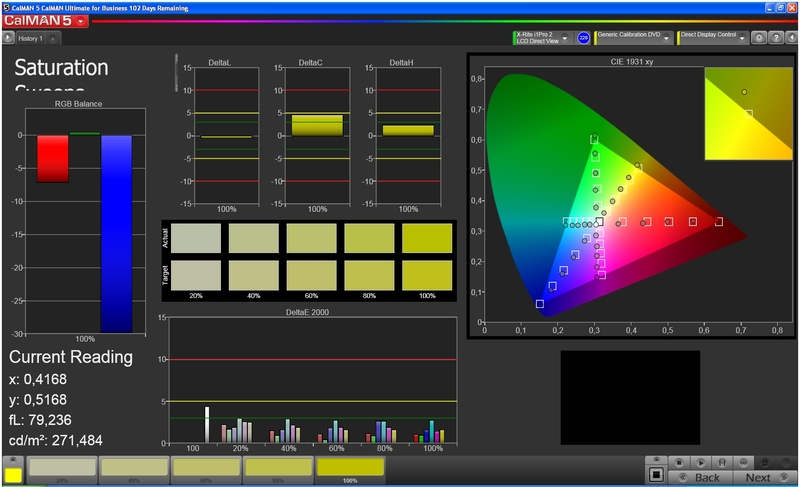 Pre-calibration and color management are no issues - all DeltaE deviation values from the sRGB color space ideals are small, usually far less than 5. 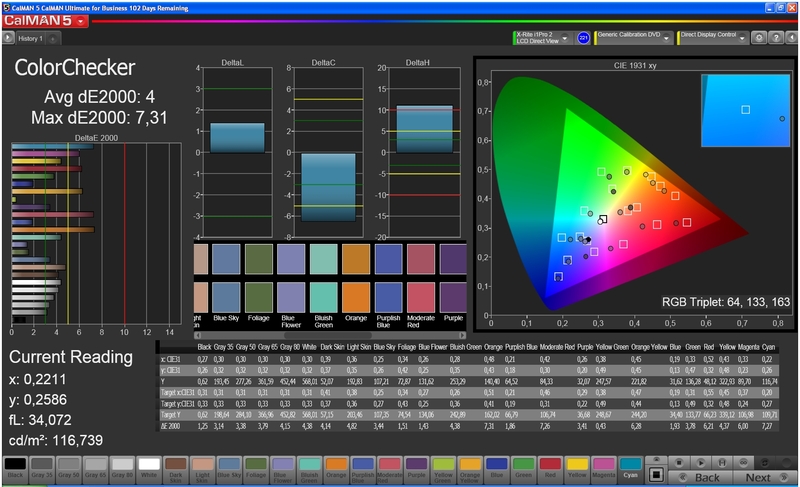 Color accuracy is great as well, with a few exceptions. 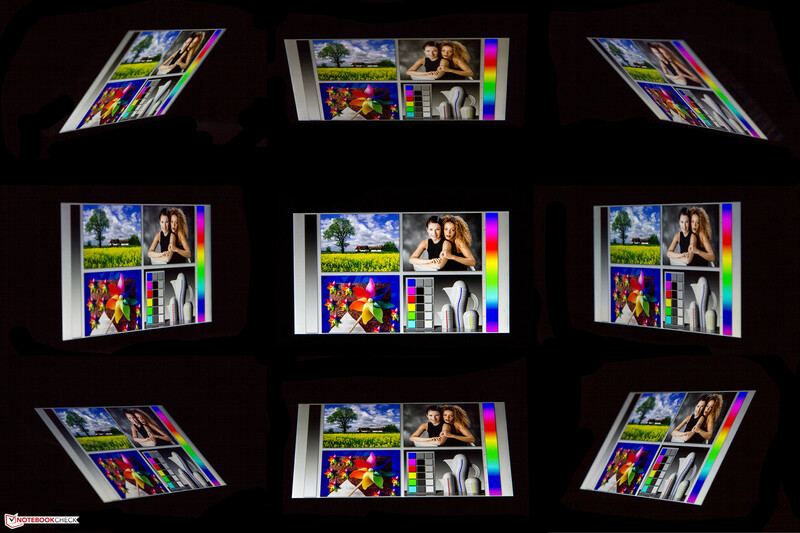 Even in the far more spacious AdobeRGB color space, Apple's display fares decently, with an average DeltaE value of 4. 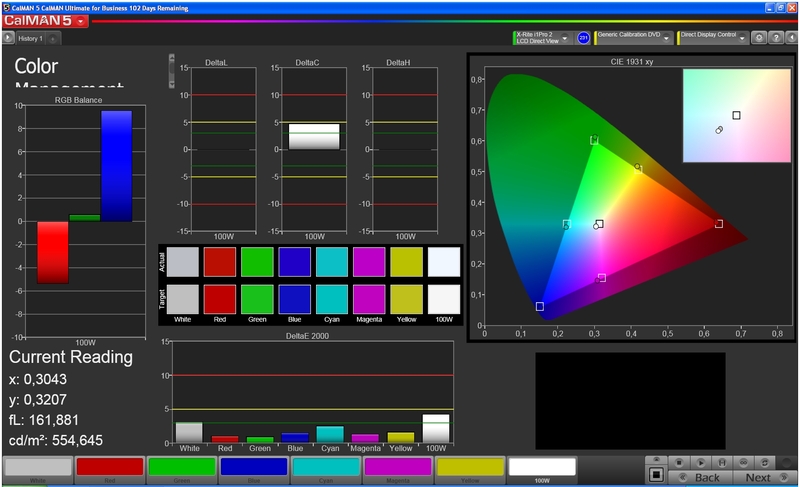 Color saturation has intentionally been reduced for all blue hues - LED displays are known for overemphasizing this color. 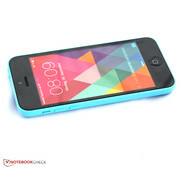 Due to the high peak brightness, the iPhone screen retains readability even on bright days. Only when the sun shines directly on the screen does it become difficult (and very strenuous for the eyes) to use due to its highly reflective surface. 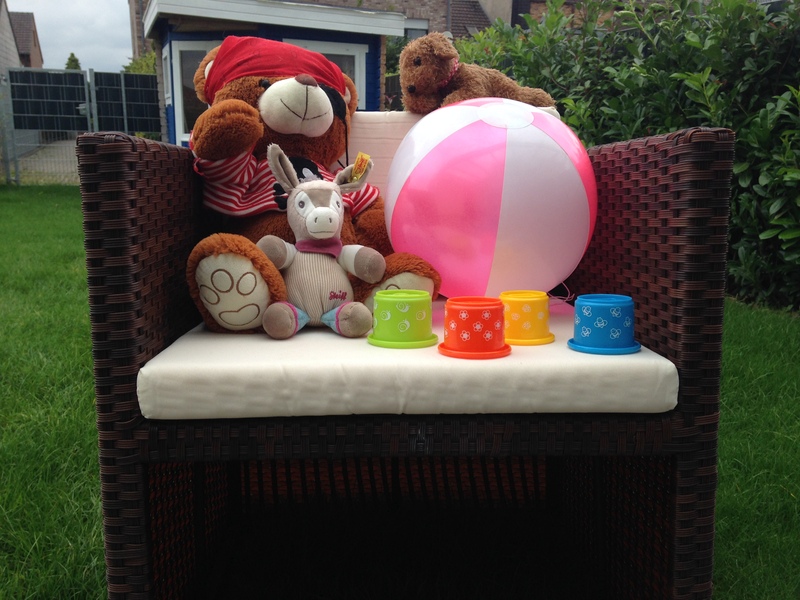 Using it in the shade or indoors, however, guarantees great readability of its screen contents at all times. The display is based on IPS technology which has seen constant improvements over the last few years, reaching superb viewing angles. Although there is a considerable decrease in brightness, the screen remains readable even under the most extreme viewing angles. One nice little detail: When the screen is tilted, the background moves a bit with it, but the app icons don't. 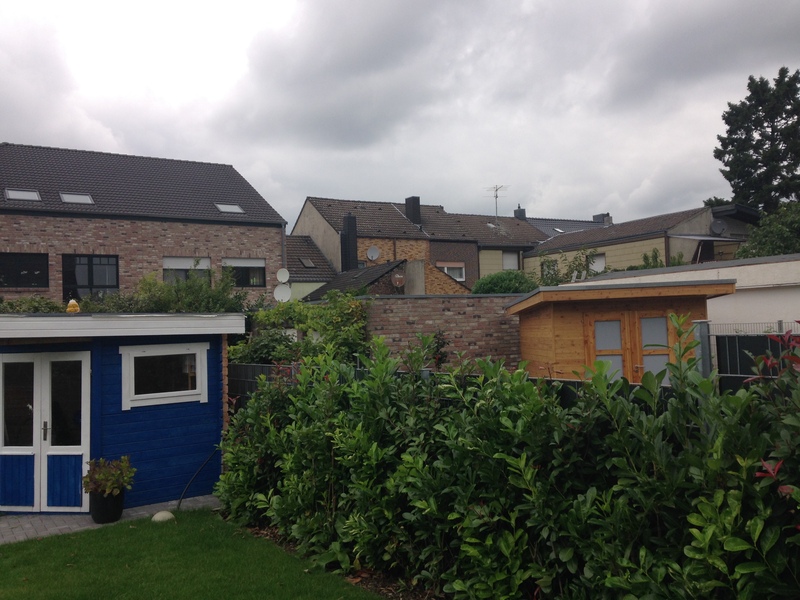 This so-called "parallax scrolling" leads to a more immersive user experience, with an increased perception of depth. In terms of raw power, the iPhone 5c simply cannot compete with current high-end smartphones made by other companies. Even back in 2012, the iPhone 5 failed to beat the Samsung Galaxy S3. One year later, a lot of new devices have entered the market while the iPhone 5c still uses the same components as the iPhone 5 of yesteryear: A dual-core Apple A6 processor clocked at 1 GHz (with a dynamical range of 800 to 1200 MHz), accompanied by 1 GB of RAM and a PowerVR GPU clocked at 266 MHz. Indeed, both the Samsung Galaxy S4 and the new LG G2 offer 20 to 30% more raw power for applications. During the 3D benchmarks, the iPhone 5c fell much further behind. Our actual gaming tests (see further below) will show whether the iPhone 5c is still fast enough to handle all games available in the AppStore. Browsing the web still amounts to a great experience, despite of the iPhone 5c's nominally older hardware. The iPhone 5c almost always stays ahead of the competition (with the exception of the LG G2, in some tests at least), actually reaching twice as good test results as the Google Nexus 4 during the SunSpider test. Subjectively, this feels about right: Websites open quickly, and navigating the browser works flawlessly. One of the main advantages for developers writing games for iOS is the manageable number of devices for which they have to optimize their apps. Accordingly, most current games in the App Store are designed with the iPhone 5 in mind. 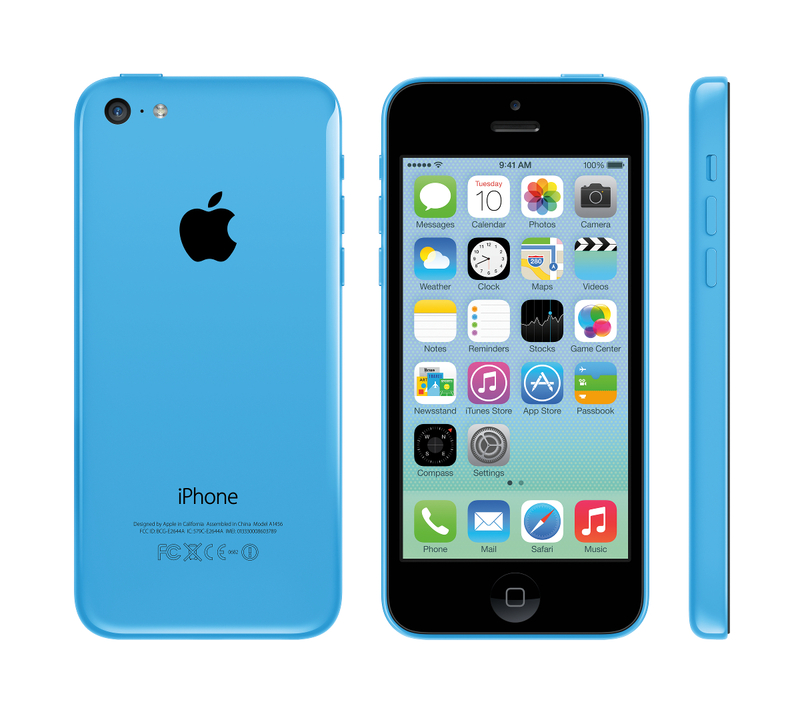 Since the iPhone 5c sports the same hardware, everything works just as smoothly on Apple's new colorful "budget" device as on the iPhone 5 itself. This might, however, change soon once apps are developed specifically for the iPhone 5s's more powerful processor and with 64-bit support in mind. 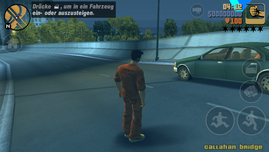 Right now, even demanding games such as GTA 3 work perfectly with short loading times. All other games we tested - ranging from Angry Birds: Star Wars to GTA: China Town Wars and FIFA 14 - ran absolutely smoothly and without any stuttering as well. ... or FIFA 14 run smoothly. Plastic is not as good a heat conductor as metal. 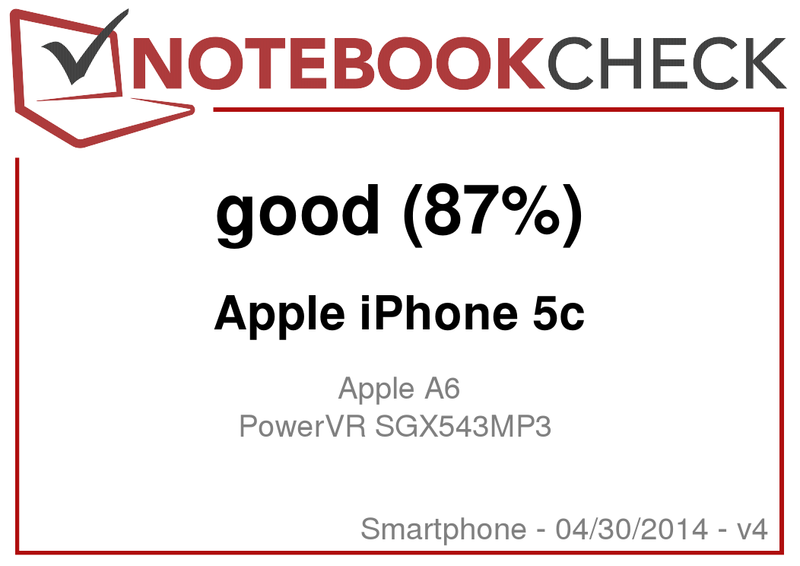 Thus, the iPhone 5c remains even somewhat cooler than the already restrained iPhone 5, with a maximum value of 38.5 °C on the front developing under full load. While this is noticeable, it is by no means uncomfortable or even unacceptable. While idle, the smartphone stays even cooler, with up to 35.4 °C right next to the speaker. Interestingly, most of its competitors (such as the Nokia Lumia 1020 or the LG G2) exhibit a more pronounced difference in case temperature between their idle and non-idle states, remaining cooler while inactive but requiring more power while under load. Overall, the heat emissions of the iPhone 5c are definitely acceptable, especially so under full load. As mentioned above, the speakerphone is well-suited for hands-free operation. 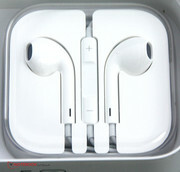 It also produces more than decent sound quality in games or while listening to music, with an excellent maximum volume, remaining distortion-free and clear up to the end. 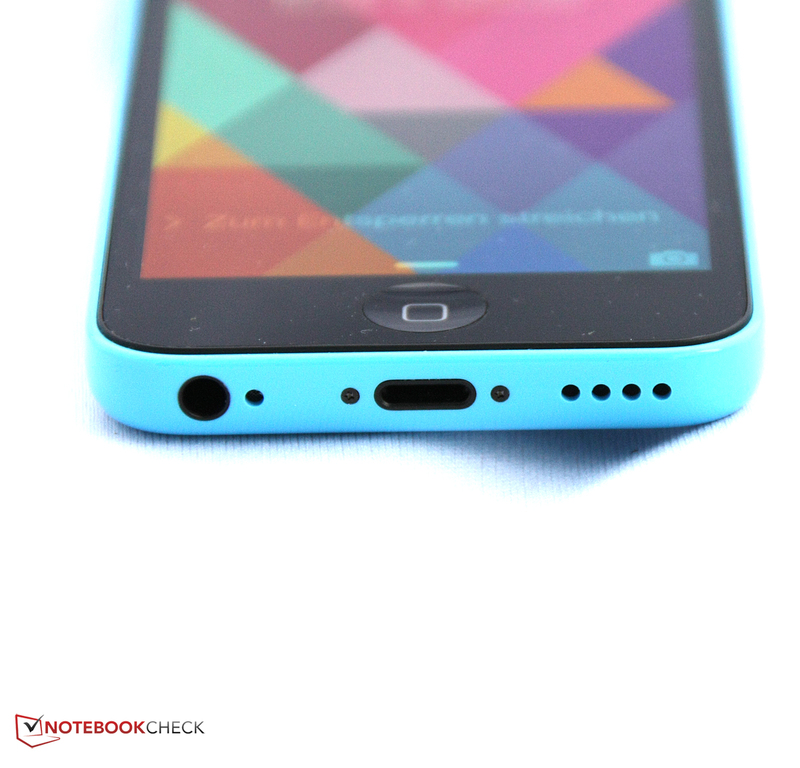 Although the iPhone 5c is a bit lacking in terms of bass, overall audio output is satisfyingly well-balanced. Naturally, headphones further improve upon this situation, although the EarPods with which the iPhone 5c ships could be better at keeping background noise at bay. 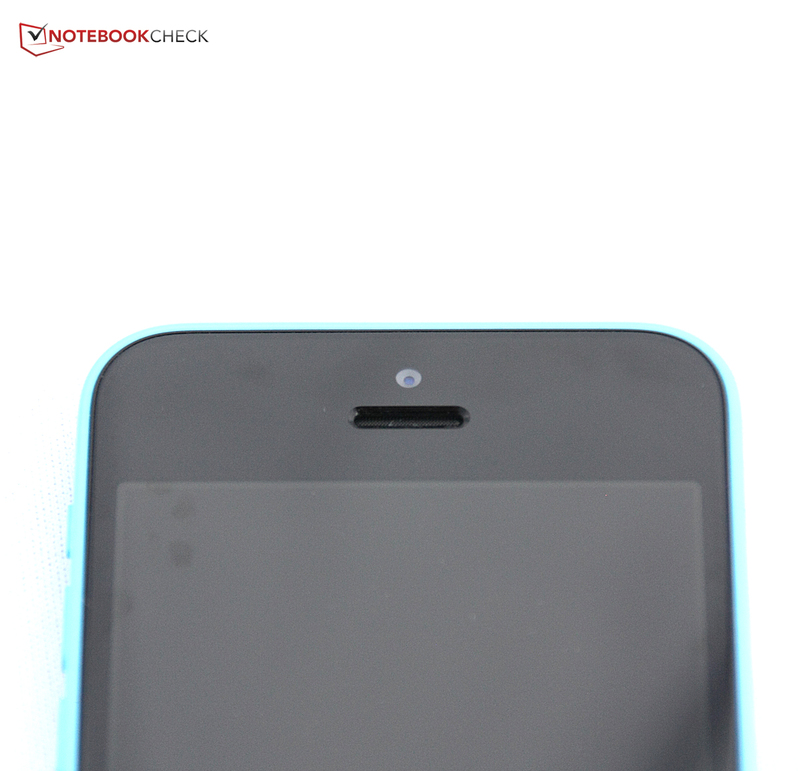 Again, the iPhone 5c behaves a lot like the iPhone 5. Only under full load does it require 0.4 watts more than its predecessor. Still, this is a lot less than what many other high-end devices like the Nokia Lumia 1020, the LG G2 or the Google Nexus 4 require - and all of this while the performance of the iPhone 5c isn't that much worse than that of its competitors. The iPhone 5c seems to be rather power-efficient while idle, but a lot of users do complain that the battery life of the closely-related iPhone 5 has decreased drastically after the update to iOS 7. Accordingly, we will have a closer look at the different runtimes of our device, trying to evaluate the impact the new animations and effects of iOS 7 have on the stamina of the iPhone 5c. Actually, the capacity of the lithium-ion battery has increased by 6% when compared to 2012's iPhone 5, from 5.45 Wh to 5.73 Wh. Under full load, the iPhone 5c does indeed stay alive for 43 minutes longer than the iPhone 5. Then again, this is the scenario where the impact of the redesigned operating system can be felt the least (in relation to that of the demanding app which is running). Indeed, the iPhone 5c's relative battery life worsens during the less strenuous tests: While browsing over Wi-Fi, the iPhone 5c dies 1.5 hours more quickly than the iPhone 5 (with iOS 6). This difference grows to 3.5 hours while the device is idle. 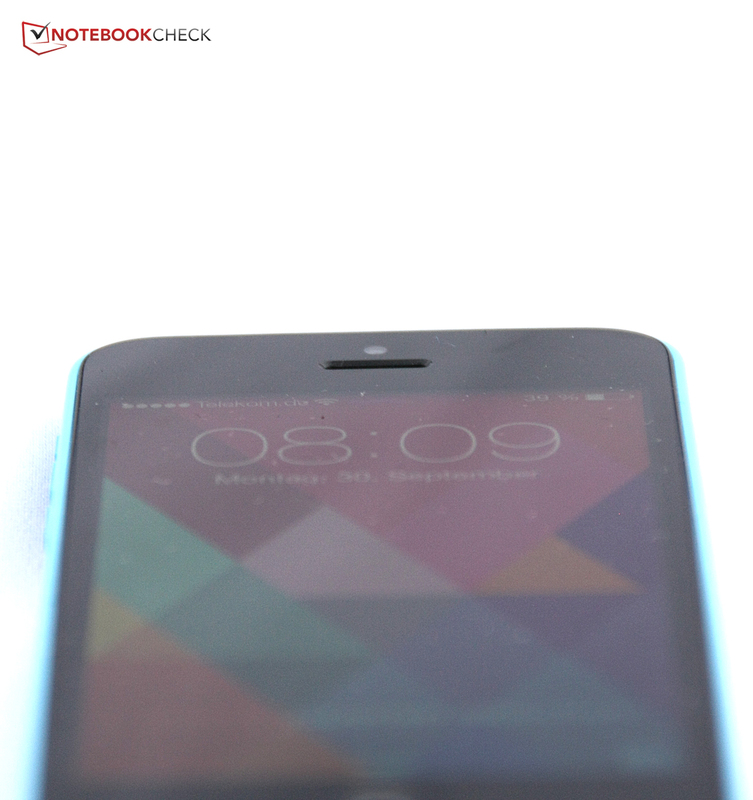 However, when compared to other high-end smartphones, the iPhone 5c does remain close to the top of the pack, with only the LG G2 being on par with Apple's colorful new device. Google's Nexus 4, for example, only lasts half as long while browsing the web. A lot of hints (most of them revolving around certain toggles in the settings app) make their rounds online when it comes to improving battery life on iOS 7, ranging from deactivating the parallax scrolling effect of the background to reducing the number of indexed elements for the Spotlight search and turning off background updates. Those who have backed away from one of the current iPhones due to their premium price points of 699 to 899 Euros (~$948 to ~$1220) may be glad to hear that the iPhone 5c is at least somewhat more affordable. This may not be enough to gain a strong following in developing countries, but it will help in trying to win over those customers who never grew fond of the white and black models. In terms of build quality and haptics, even the "cheap" iPhone feels like a premium device although the plastic case is quite prone to fingerprints. The only (minor) downside? Applying a certain amount of pressure to the touchscreen leads to unfortunate display errors. iOS 7, however, is magnificent. Its design language feels much more mature, and the usability of the pre-installed apps has been improved. In addition to this, potential buyers get a decent camera, almost high-end performance levels, a wide range of well-fitting accessories and decent voice quality. 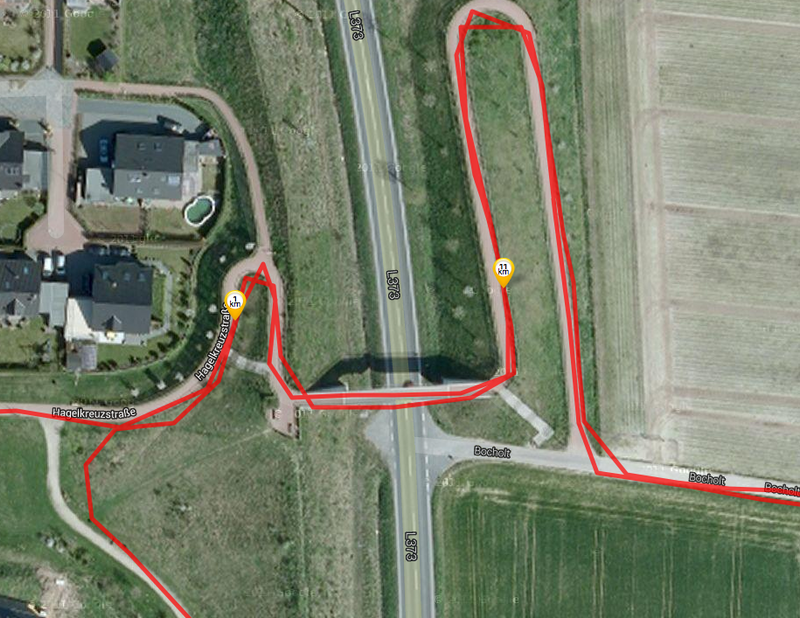 The GPS module works better than those of some navigation systems and the iPhone 5c's display and speakers are great. The Wi-Fi module is a bit of a letdown due to its mediocre signal strength. 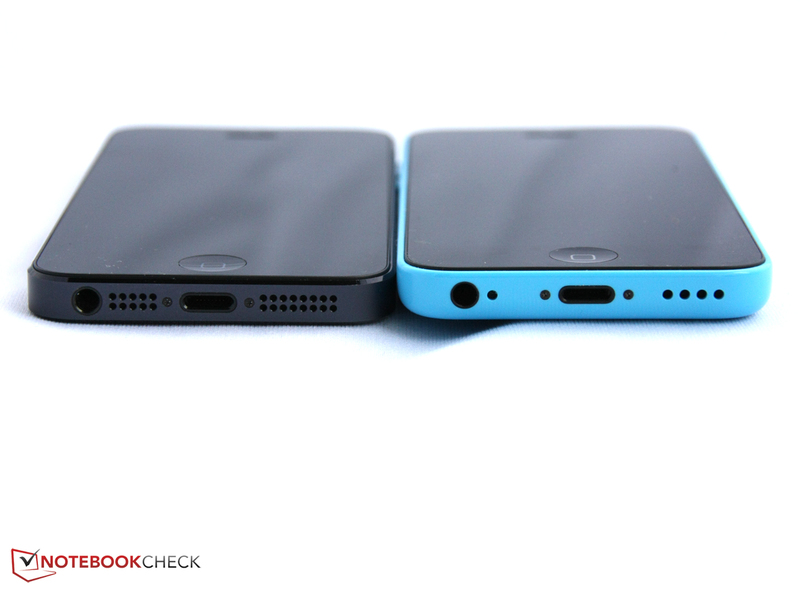 In addition, the iPhone 5c has also become slightly larger and noticeably heavier when compared to the iPhone 5. It does, however, stick true to Apple's brand ideals, feeling like a premium device and remaining exceptionally easy to use. Still, why should one buy this phone instead of an only slightly pricier iPhone 5s with an aluminum body and better performance? Next to a slight discount (which can feel like up to 50% with carrier subsidies in some countries), the main difference lies in the availability of various color choices. At the same time, this helps in not diluting the high-end iPhone 5 brands which retain their "more serious" look as well as their higher entry prices. Still, it would have been nice to see an even stronger differentiation in terms of price, but maybe also specs, as Apple has done with its iPod lineup (down to the affordable iPod Shuffle). After all, not all customers need a high-end CPU. One thing might be important to keep in mind when deciding in favor of the iPhone 5c: Other than the iPhone 5s, it does not support 64-bit applications. It doesn't feel completely implausible that two years from now, many apps will solely be available for the iPhone 5s and its successors, but not its more affordable 32-bit sibling. In Review: Apple iPhone 5c. 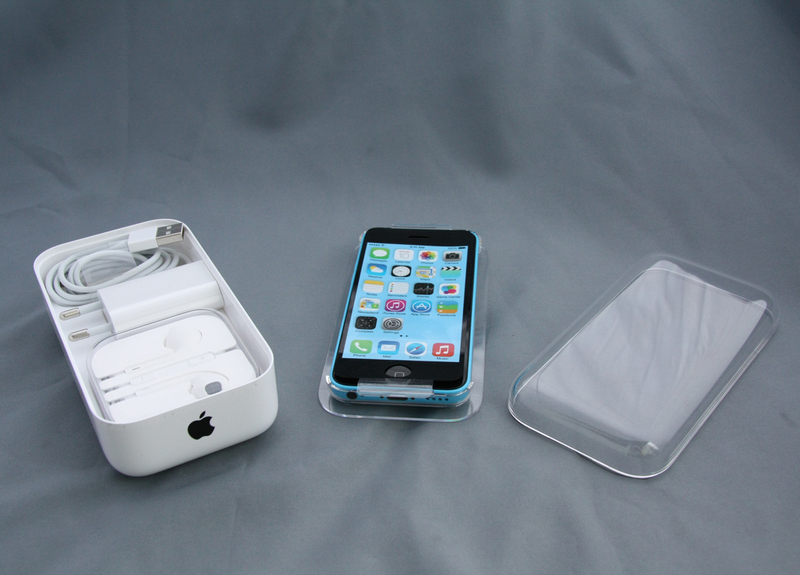 Like Snow White in her coffin: The iPhone 5c ships in a special box, iPod-style. Another first: Apple offers a "cheaper" new iPhone next to its high-end flagship model. The 16 GB version costs 599 Euros (~$813). 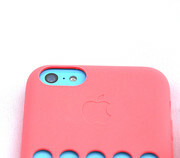 The innards of the iPhone 5c closely resemble those of the iPhone 5. 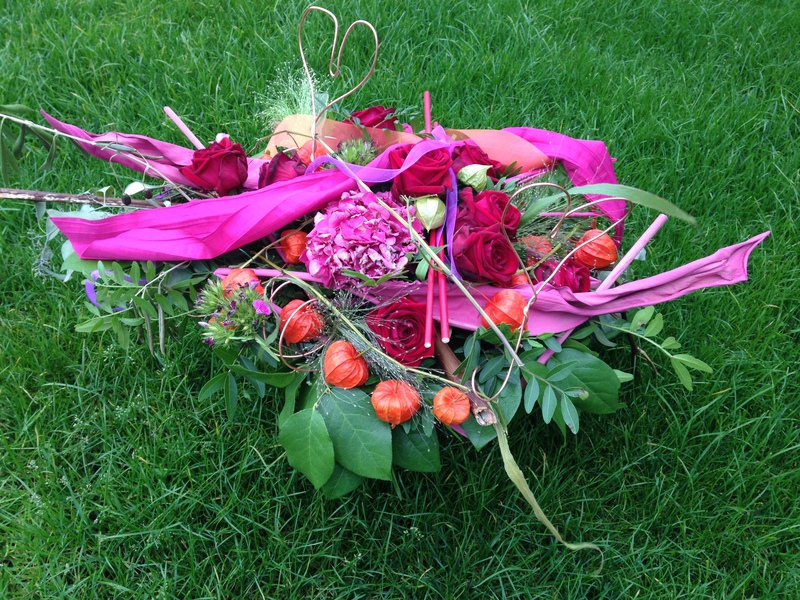 On the outside, however, it is a bit larger in all dimensions and noticeably heavier. 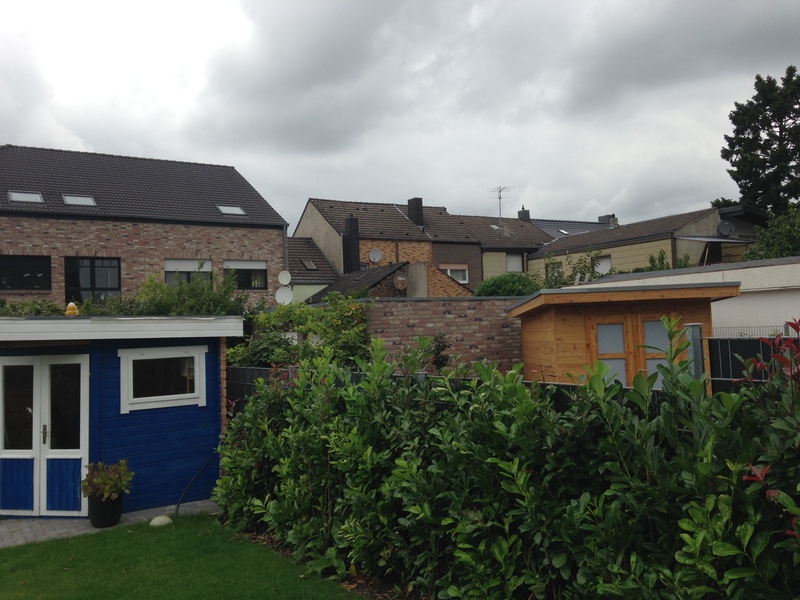 Still, this is not too big a deal, as this comparison shot shows. The iPhone 5c also ships with the new iOS 7 operating system (although this is also available for the iPhone 5). 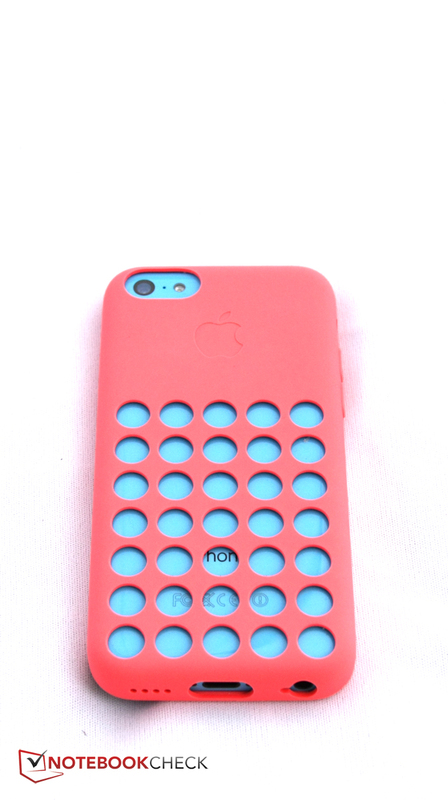 Perhaps the most crucial difference: The iPhone 5c comes with a plastic case - and in a wide variety of colors. 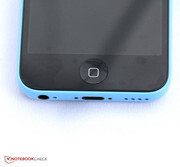 Our test device has a light blue hue. Applying pressure to the touchscreen leads to display errors. 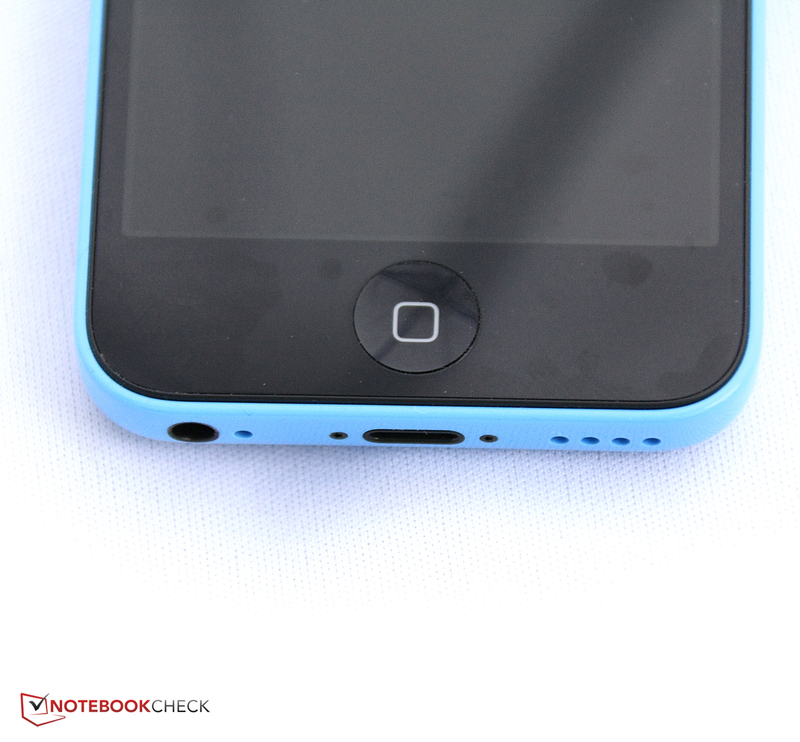 Apart from that, the iPhone 5c's build quality is every bit as good as we have come to expect from Apple. ... to the home button. 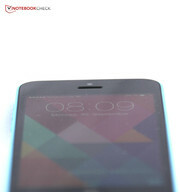 ... which almost turn the iPhone into a sibling of the Nokia Lumia 620. 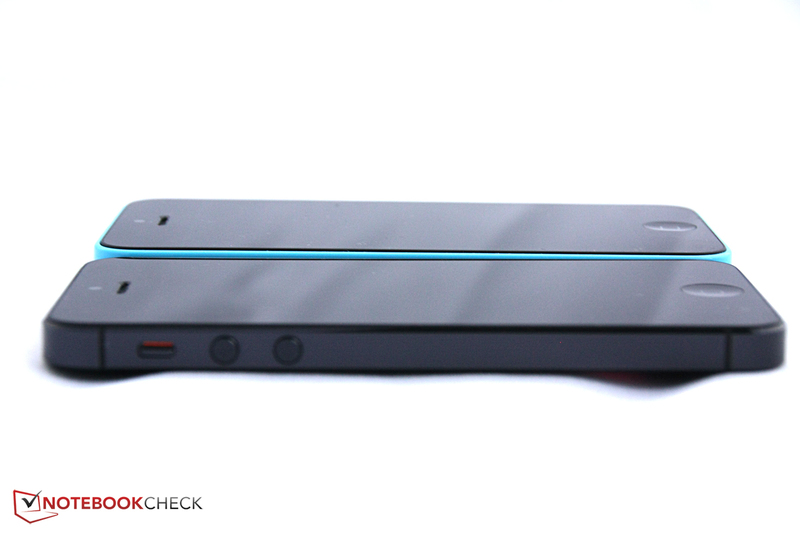 Neat effect on the back - after all, the color is supposed to remain visible. 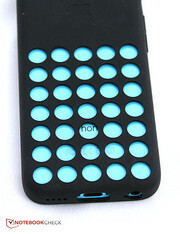 The colorful silicone cases make it possible to choose ... unusual combinations. 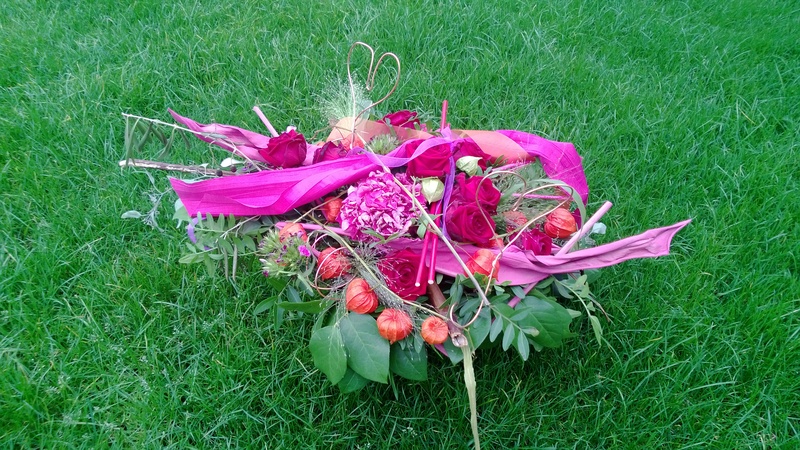 We are not sure whether we are too fond about combining pink and blue. The innards have mostly remained the same. ... this is more or less a revamped iPhone 5. The same holds true for the camera (8 megapixels). 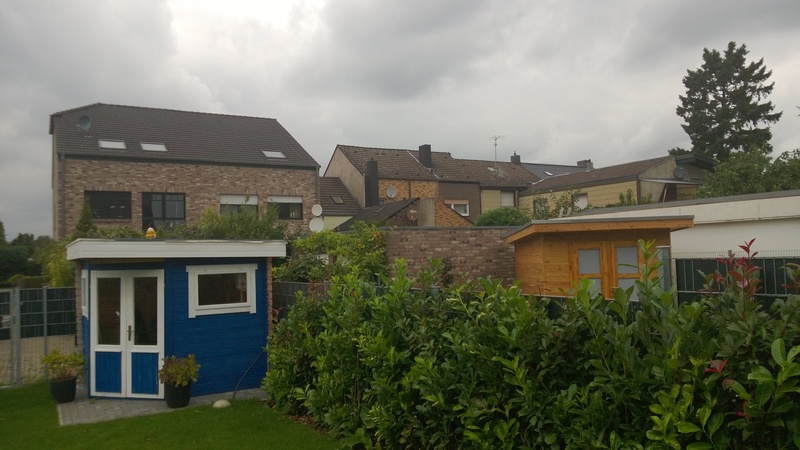 Its picture quality is quite decent, but there is some tendency towards a bluish tint. The front camera is better suited for Facetime calls and the like. 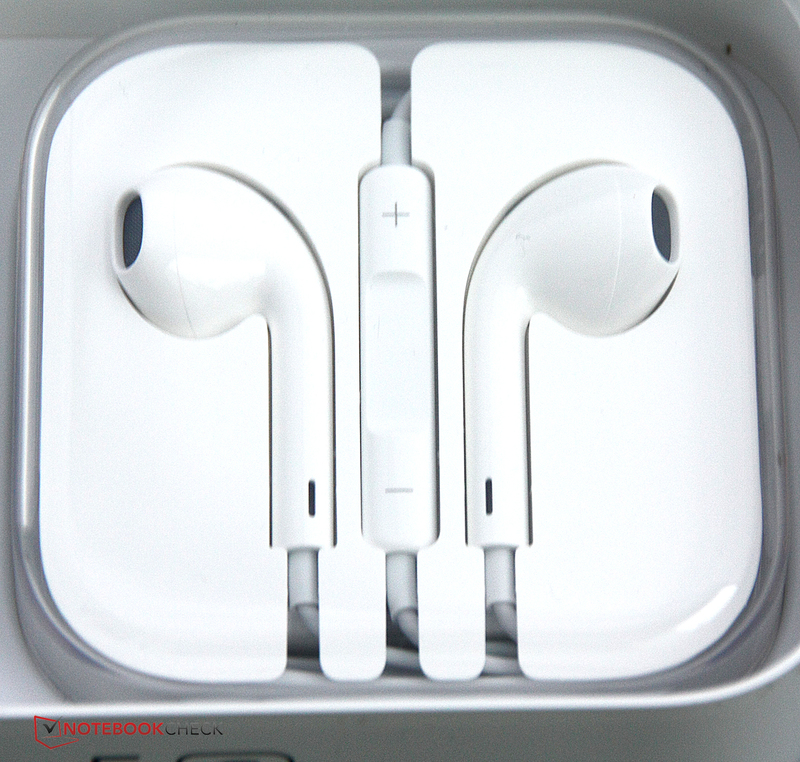 The EarPods could use some better shielding against noise, but their sound quality is okay. 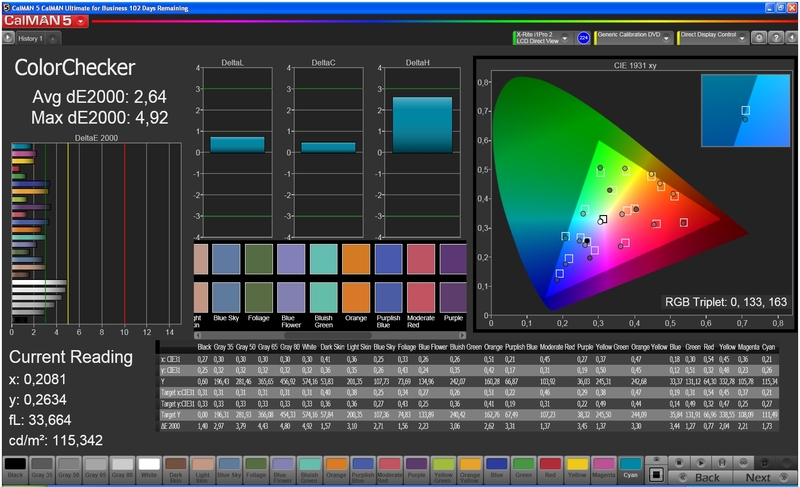 ... even though its non-HD resolution has been outclassed by its competitors. Its black levels could be better too. 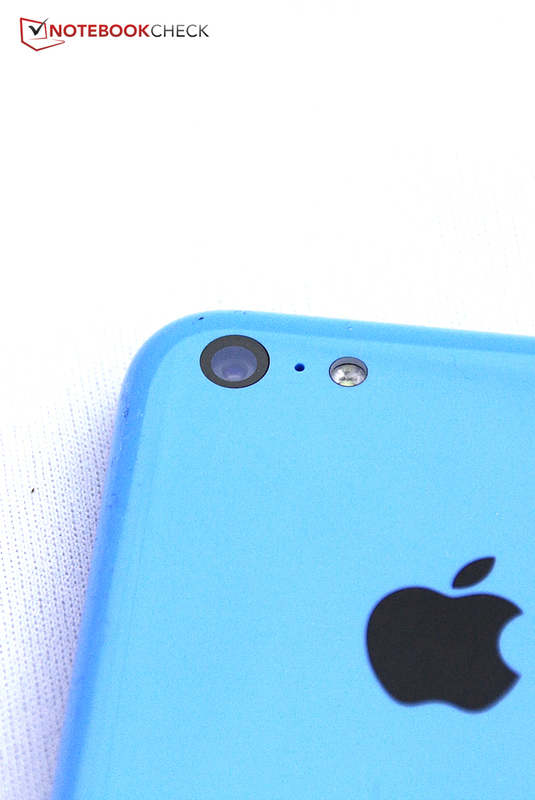 Overall, the iPhone 5c feels like an "in-between" smartphone. However, it is still an iPhone - which means it offers some great build quality and well-chosen innards. Apple's build quality is just as great as always, despite of the iPhone 5c's lower price tag. A slightly higher-resolution display (at least 720p) would be nice by now. In the future, some users might not be too fond about the missing 64-bit support. That Apple creates a smartphone that is caught between two stools, neither being a lot cheaper than the iPhone 5s (apart from the apparent price difference when carrier subsidies are taken into account) nor being decidedly more powerful than current mid-range devices. Apart from that: Wouldn't it have made sense to just offer the iPhone 5 at a lower price point?